Starring Academy Award® nominee Bruce Dern (Coming Home, Best Supporting Actor, 1978); Academy Award® and Emmy® nominee Rip Torn (Cross Creek, Best Supporting Actor, 1983; TV’s “The Larry Sanders Show”); four-time Golden Globe® nominee David Carradine (Kill Bill Vol. 2, Bound for Glory, TV’s “North and South,” TV’s “Kung Fu”); and Academy Award® nominee Mariel Hemingway (Manhattan, Best Supporting Actress, 1979), The Golden Boys is a light-hearted comedy about three old bachelors whose lives are turned upside down when they decide that one of them should marry. A “quaint” (Newsblaze.com), “fun, swashbuckling ride” (Ticketstubz.com) that is “filled with magical moments” (SSG Syndicate), The Golden Boys DVD, including a retrospective featurette containing interviews with David Carradine discussing his life and career, will be available this August on DVD. 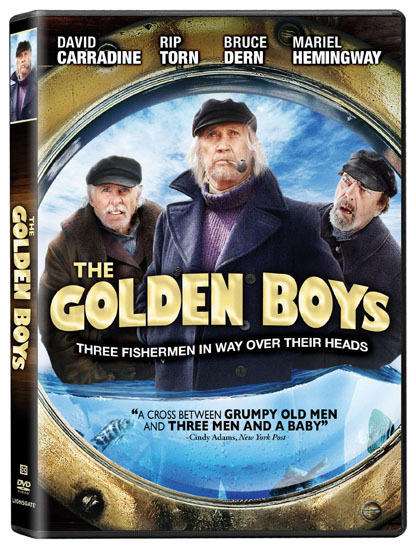 Acclaimed actors David Carradine, Bruce Dern and Rip Torn co-star as three retired sailors looking for a First Mate to care for them. But when strong-willed Martha (Mariel Hemingway) signs on to the job, the seamen find themselves headed into uncharted waters in this delightful family comedy. “From Zenmaster to Shipmaster: The Life and Career of David Carradine” – a retrospective featurette containing interviews David Carradine completed while shooting the film; discussing his enthusiasm for the film and his role in it – along with many fascinating stories about his life and career.